1) You might be dealing with upset customers. Many customers are sold on the beauty and durability of prefinished wood floors without being informed about the details of the warranties and the simple maintenance necessary to ensure performance and satisfy expectations. Perhaps they thought their floor would look brand-new for 30 years and have since been informed that their warranty doesn’t cover general wear and tear. The good news is that you often can help make their floors look much better. The bad news is that sometimes you just can’t. Sometimes, the wear layer on such floors is so thin that they can’t be resanded, and the finish is worn so badly that a recoat won’t give them the appearance they want, so a new floor is the only option. This is also the case with some new floors that simply can’t be recoated. (For more on that, see #6). 2) Try to figure out what the product is. Before you do anything, try to find out as much as possible about the floor, and ask if the customer has any leftover flooring. 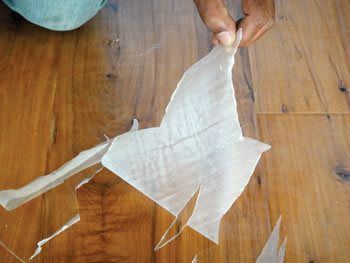 If you can find out the manufacturer of the flooring and its age, that will give you valuable clues as to what the finish is and how difficult it may be to recoat, or if recoating is even possible (in the case of wax or most natural oils, for example, the floor usually must be either recoated with the same product or resanded). While you are asking questions, ask what maintenance products and tools have been used on the floor (but don’t take that as fact—oftentimes they may tell you what they think you want to hear). Ask to see the maintenance area or closet. 3) You don’t always have to abrade. 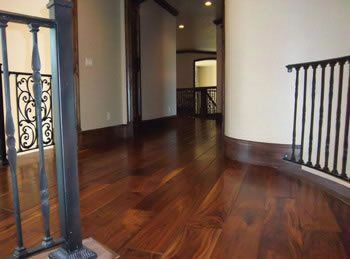 For decades, the industry standard for recoating wood floors involved screening with a buffer and recoating. These days, there are several options available to recoat the floor using a chemical recoating system or a chemical/abrasion combination recoating system. For some floors that are difficult to abrade, such as distressed floors, beveled floors or older cupped floors, one of these newer systems may be the best or, in some cases, the only option. 4) Doing a test area minimizes the gamble. Doing a recoat without trying a test area first is a reckless gamble. The recoat may go well … or you may discover that the finish won’t flow out. Or, the finish may flow out, but eventually you realize that the finish wasn’t actually stuck very well to the floor—gravity is the only thing holding it down. There are many possible pitfalls that can lead to these scenarios. One of the most common is contamination from a buildup of maintenance products, including overspray from maintenance products used on wood furniture, stone counters, appliances, etc. Some maintenance products, such as oil soaps, are usually relatively easy to remove from the floor with a strong wood floor cleaner from a finish manufacturer. Others—a notorious one is Orange Glo—say they are recommended for wood floors but leave an acrylic or oily residue that sticks and smears on wood floors, actually attracting even more dirt. One recommendation from Orange Glo is to remove such residue using a mixture of ammonia and water. Also, at least one of the chemical/abrasino recoating system manufacturers available in the industry guarantees successful removal of all contaminating residues on the floor. 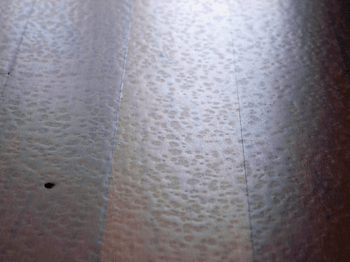 If you aren’t going to use a chemical recoating system, another important step in fact-finding is figuring out how hard the finish is to abrade. An older floor with a standard urethane finish may abrade just as easily as a typical site-finished floor, but many newer floors have finishes—contrary to popular belief, regardless of whether they have aluminum oxide or ceramic in them—that are extremely difficult to abrade. Abrading them will require more effort and many more abrasives, so that must be factored into the bid. Last, some floors can be abraded but still won’t take a new coat of finish, as they are simply incompatible with recoating (see #6). 5) Choose your test area carefully. Selecting a test spot can be tricky. It needs to be in an inconspicuous area, but also in a place on the floor where cleaning products have been used on a regular basis. So, inside a closet or under a rug won’t work, but an area out of direct sight—under a kitchen cabinet toekick, for example—might do the trick. Of course, your one test area isn’t a guarantee—be aware of the risk of spot contamination from products like furniture polish, glass cleaner and even fabric softener sheets. And, even if the finish on your test area looks like it went down well, once the film is formed, do an adhesion test to see how well the finish is stuck to the floor. You should be able to scrape the floor hard enough with a coin to almost dent it while the finish stays firmly adhered. If it doesn’t, consider the recoat process you tried a no-go. 6) Beware: Some factory-finished floors are impossible to recoat. For years, contractors have been wary of trying to recoat newer prefinished floors because many have finishes that are difficult to abrade. Now there are some prefinished floors that simply cannot be recoated. For example, prefinished wood floors that have well-known brand names for non-stick and anti-stain ingredients (Teflon and Scotchgard, to be exact) may not accept a new coat of finish, no matter what abrasion or chemical recoating product is used. Of course, this can come as a shock to customers if they weren’t informed of this when they bought the floor … and are now told that if they want their floor to look better, it must be totally resanded (if the wear layer is thick enough) or replaced. When testing finish on these floors, depending on the chemistry of the UV finsihing system, the finish applied may crawl immediately, or it may flow out and appear to dry fine but have no adhesion. Detailed cleaning is a critical step in the chemical recoating products available on the market, and that speaks to how important cleaning the floor is to any recoat, even one with a standard abrade-and-recoat process. Contractors may think that they don’t have to clean the floor when they’re doing a standard buffer abrasion—“I’ll just sand it off”—but that doesn’t work and, in fact, can make any problems worse. If all the dirt and contamination isn’t removed from the floor before buffing, both will be ground into the floor, scratching the floor and driving contaminants into the soft grain and gaps. Instead, use a high-quality cleaner from a finish manufacturer, and if you really want to clean deeply, consider using techniques common to gym floor contractors: using a small autoscrubber or “wet-screening,” in which the cleaner is applied to the floor, buffed with a screen or pad and then vacuumed up with a wet vac. Whatever method is used, completely removing the contamination from the floor is critical. 8) There are many different products available to help with recoating. You need all the weapons possible in your arsenal to handle the situations you come across, so make sure you are up-to-date on the latest products available specifically for recoats. They range from chemical recoating systems, to kits that test for contaminants on the floor, to sanding machines equipped specifically for abrading recoats, to floor scrubbers specifically for wood floors. One size does not fit all when it comes to recoats, so being familiar with all the options will increase your chances of success. 9) You may need to get creative. Finish manufacturers may shudder when the words “get creative” are in the same sentence with “wood floor finish,” but some contractors have experimented with their own techniques enough to feel confident using them on a customer’s floor—even knowing that if something goes wrong they won’t be able to turn to the finish manufacturer for help. That may include using a coat of de-waxed shellac (notorious for sticking to almost anything and drying rapidly), or it may mean adding some dye to a finish coat to help blend a worn area. Specialized wood repair kits and color matching kits, wood-tone permanent markers, graining pencils and epoxies mixed with color powders are among the techniques sometimes used to help disguise blemishes before recoating, and amber tints/dyes or aging some poly are techniques to match the appearance of an older wood floor. Be confident in any “creative” finish process you use, because if something goes wrong, you’re on your own. Remember that using a low-gloss finish helps disguise scratches and dents. 10) Leave your contract open and your customers informed. Since you don’t know what to expect on a recoat, the language in your contract has to be flexible enough to leave your options open, and the customer must be aware of what could happen. Just as important, be clear about realistic expectations for a recoat. Customers may expect that a fresh coat of finish will make the floor look new but, of course, that isn’t usually the case. A new coat won’t totally disguise gouges from pet claws, for example, and some factory-applied finishes turn white when scratched and stay white, even with a new finish coat. If there are traffic patterns down to bare wood but the customers won’t or can’t have the floor resanded, explain that you’ll do your best to clean the area and build up the finish, but it probably won’t look the same. Finally, it can’t be said enough: Go over basic maintenance practices with the customer so they can keep your new finish coat looking as good as possible. (Consider giving them the maintenance PDF formatted for customers at www.hardwoodfloorsmag.com/Maintenance101.) If you can get customers to be in contact with you for maintenance products, you will be the first person they call when their floors need a recoat.